One major area of worldwide growth in the last year has been in the mobile market – both in terms of technology development and consumer behavior. Facebook itself now derives roughly 30% of its ad revenue from mobile. More broadly, mobile ownership in the U.S. has grown rapidly. According to a 2013 Pew Research Center study, a vast majority of American adults, 91%, own a cellphone, over half (56%) have a smartphone and a third (34%) own a tablet computer. 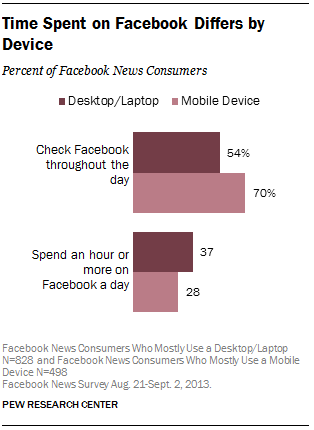 But, desktops and laptops still have broader reach and remain the primary mode of digital news consumption. This is also the case for Facebook usage among U.S. adults, the survey reveals – though mobile news consumers tend to check in more frequently throughout the day. 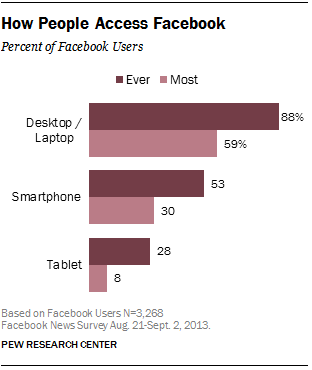 Overall, 88% of Facebook users say they ever access the platform on a desktop or laptop computer, while 53% access it on a smartphone and 28% access it on a tablet (61% access it on at least one mobile device). And when asked what platform they access it most on, the desktop/laptop again ranks first at 59% of all users, compared with 30% who mostly access Facebook through a smartphone and 8% who mostly access the site via tablet. Among Facebook news consumers, the split is narrower, though desktop/laptop is still the primary device: 53% desktop/laptop versus 46% mobile. Female Facebook news consumers are more likely than male consumers to primarily access the site through a mobile device (49% vs. 42%), as are younger Facebook news consumers compared with older consumers. Over half of Facebook news consumers who are 18-29 years old (56%) and 30-49 years old (53%) mostly access the site though a mobile device, compared with only about a quarter (24%) of Facebook news consumers who are 50 years of age or older.